Meet a lovely couple and follow them step by step as they prepare their trip, and spend a dreamy week in Paris. 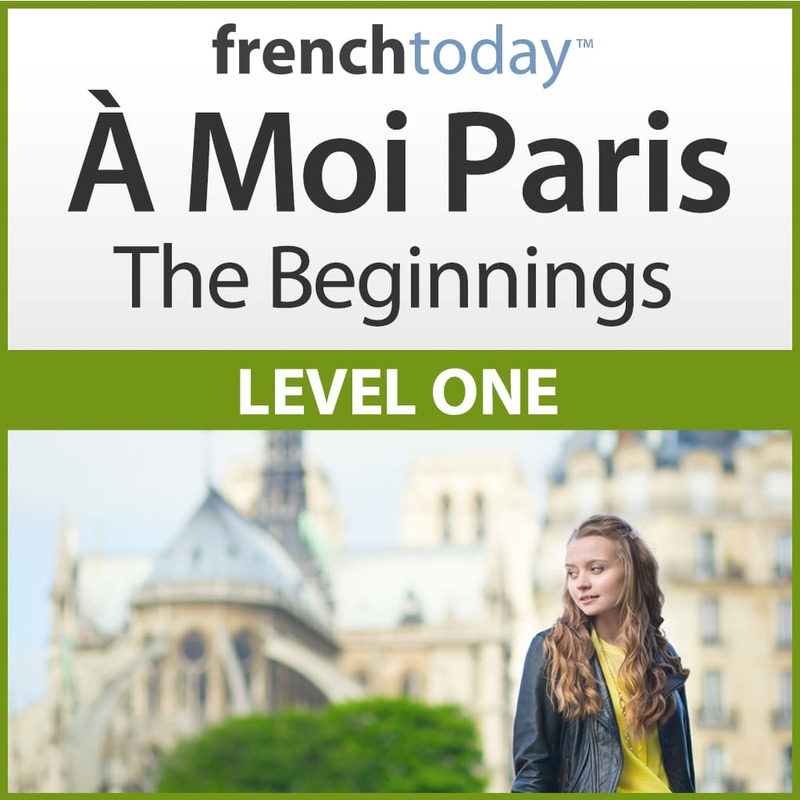 This intermediate level novel combines fun French practice with practical info on Paris. It’s a fantastic way to prepare a trip to the City of Lights, learn about French culture and gain fluency in French. Includes a companion Q&A workbook featuring native French male and female voices so you can check your understanding of the story and practice your speaking. 5.5+ Hours of story chapters + Q&A exercises – all professionally recorded by a Parisian native + 157 pages transcript with english translation. What Paris neighbourhood should you choose? I started studying with Camille and French today several years ago. My first audio book was A Moi Paris and it was followed by Une Semaine à Paris. I also have The Fairy Tales audio recordings. I always come back to frenchtoday. The products are great and the web site is super. I highly recommend the products and if your New Year’s resolution is to learn French, start here. You will never be disappointed! I love your website. So many good things to learn. I really stretched by getting the Level 7 course. It’s a little hard for me, and I don’t find that I use the conditional etc. that much. Anyway, keep up the good work…. As an educator, and rusty francophone, this book was invaluable in helping me reacquaint myself with the speaking and listening skills I need to jump back into the French classroom. I spent several years teaching English at the middle school level even though my degree is in French. I am an American who studied French in high school and college and lived in France during college. I could not have regained the fluency without this program. i still use other books and programs from Camille and Olivier- always trying to improve until my next trip to France. Just difficult enough to be challenging, but almost completely understandable. Everyday language. I love the clarity of the spoken delivery. The two delivery speeds are excellent. The slower is not stilted and thus boring and the street speed is still clearly detailed. Can’t wait to go to my french immersion! Excellent, and informative about Paris ,travelling to it and insights into it’s surroundings. Thank you for making French fun to learn! The blog and the stories are great and help with learning in context. Love the app and how the written text is at your fingers to follow. Also thank you for helping me restore my account access! A bientôt! Charming! Love the speed option as well. So involving while be instructional! Thank you. This audio book is just what I need to get ready for my first trip to Paris. The two contrasting speeds are perfect, one at my level and one to challenge me. Excellent experience. love the story telling. There is nothing like FrenchToday on the market of French learning. It is absolutely worth your money. The voice is very clear which will tremendously help you to sound more like a native speaker. The flow and vocabulary of the story matching daily life conversation. The dialogues have some romantic parts which are exactly what people looking for when they thinking about French language. 10/10 would buy again ! Thoroughly enjoying it and making progress. All the mistakes that I did not know I was making. An entertaining yet thorough way to improve listening comprehension. Having both the slow and street speed recordings along with the PDF’s is so wonderful and helpful! No technical issues at all. Everything works perfectly. Highly recommend! Another excellent audio novel from Camille. I’ve previously purchased and enjoyed ‘A Moi Paris 2’, and this is a great follow-on. Both products are an excellent way to convert high school French into something that you can actually use when visiting France. I am taking a 13-year-old granddaughter to Paris this summer and thought this might be a good way to brush up my rusty French. It exceeds my expectations! Not only do I have the opportunity to hear everyday French, but much of the story relates to things we will be doing. I’ve been listening to each chapter in “street French” and then trying to answer the questions. Then I listen to it slowly, while looking at the transcript, to pick up anything I missed and to study any new expressions or phrases. Last week I spent several days with my granddaughter, who has not yet studied any French in school. She has been working with a beginners’ program on the computer. I had her read the transcript in English while we listened to the slow version of the story. She was pleased to find some of the things she had studied on the computer used in everyday conversation, and noticed the words that were similar in French and English. Thank you for providing such an enjoyable way to study French! In general very useful , but in some cases , translation to english are not accurate . I am already reasonably fluent in French (although I still have a lot to learn!) so I bought this novel as some good practice for me. I found it easy to understand and interesting. I would definitely recommend it to those wanting more practice. I listened to it on my way home from work and couldn’t wait to get started when I hopped in the car. I’ve listened to it through once and I’m looking forward to starting it all over again and picking up even more learning from it. I have been learning french on and off for about ten years now. The problem I had was there was no structure to my learning, I flitted from one thing to another and also had a tendance to read french but not listen to it. With the exelent une semaine a Paris audio novel series l can do both. Well worth the money. I have found all of French Today’s material to be relevant. And our recent purchase of ‘Une Semaine à Paris’ is no exception. 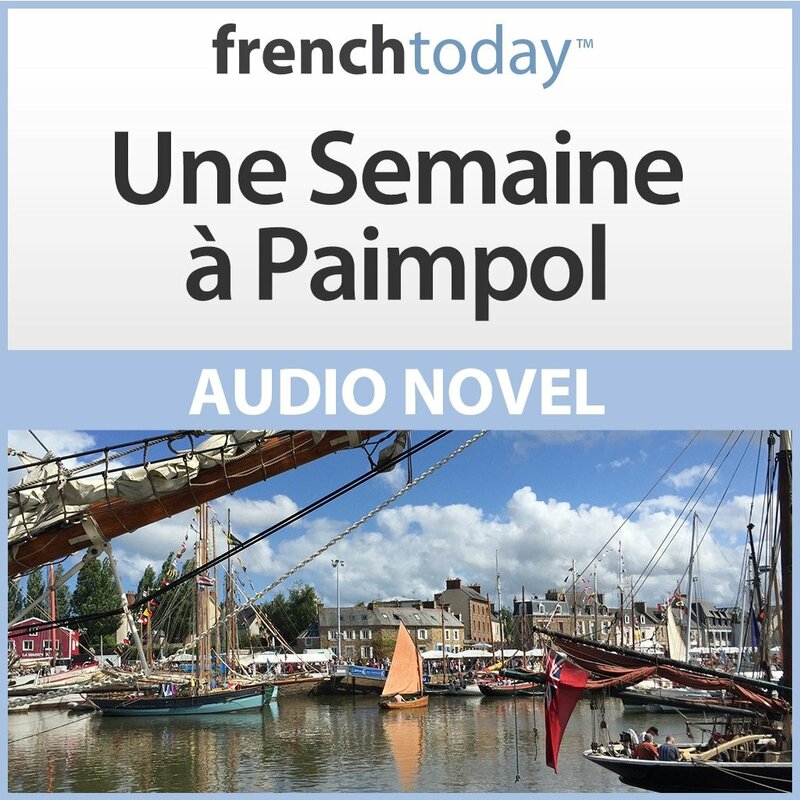 We’re planning a week’s trip to Paris and this audio novel gives us so much relevant vocabulary, plus the street French version can’t be matched. It is also great to take in the car while I commute. I like to listen to a chapter while I drive and then test myself with the Q&A. And I have to say that I very much appreciate Camille’s voice. 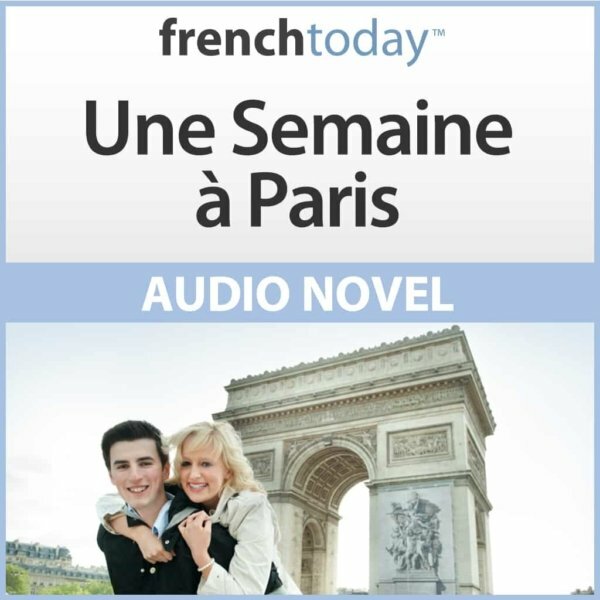 We’re French Today fans and, through this audio novel, we are already living our week in Paris! Thank you very much for giving me the free upgrade of Une Semaine A Paris. I’ve been enjoying listening to Camille’s recording of the new Street French version in my car. Everyday I must spend 3 hours commuting to and from work. So listening to Camille in my car on my way to/from work is pretty much the only way I can progress with learning French. I love the new PDF format with the English text right below the French text. It’s much easier on the eye this way. In the past I had to open up the English PDF and position it next to the French PDF to obtain a “side-by-side” translation, which made me feel quite dizzy after a while. One thing I did notice is that Thomas and Angela still visited the Virgin Megastore on the Avenue des Champs-Élysées but currently the Virgin Megastore is no longer there. Perhaps you could replace the Virgin Megastore with some other store that still exists in the next upgrade? I love this website. I’m between beginner and intermediate French levels but am able to enjoy the book very much. I am most excited about the many articles and new vocabulary (quite handy for traveling) you receive vie email once you make an initial purchase. We will be traveling to France soon, and my French will still be very rusty but I intend to continue studying with these delightful products. I’ve really enjoyed listening to the audio book while I drive places. it helps keep my mind on the loop and forces me to think in French a bit more every day, it’s very helpful with pronunciations, now I know that the way I was reading was wrong. it also helps me to keep interested since the subjects apply to situation that we might really encounter. It would have been helpful if the characters had their own voices, it would make much clearer who is who, nevertheless grate work! I have found the French Today audio Novel and Workbook Une Semaine à Paris to be extremely helpful, and (so far) the most delightful experience on this journey to learn this beautiful language. I drive 300 miles a day as a courier and I don’t know how I could bear it without the French Today lessons. I completed the 120 half-hour lessons offered by Pimsleur and learned much but the experience is not comparable to the French Today method. I purchased Une Semaine a Paris some time ago, but just recently focused on this audiobook as we are preparing to travel soon to France (including une semaine a Paris!). The story is great as it follows a couple along their journey from choosing where to stay in Paris, to packing, to air travel, and finally to exploring Paris. The language level is low intermediate and full of idioms that one is most likely to hear in these situations. Inserted between the chapters, Camille has included (in English) a wealth of very helpful information that relates to the previous chapter. I listen to each of the French chapters over and over (while walking with an mp3 player) and soon I am in Paris with my friend, Camille, who is definitely preparing me to enjoy Paris! My coincidence level has definitely grown as I pick up more and more fluency relative to these unique situations. I love this approach! Listening, reading, together or separately. And I think the inserts are great. They give practical information in English on Paris arrondissements, ordering food, saying hello and other useful tidbits. I have several of the audiobooks and audio lessons and find them all to be very helpful. For me, Une Semaine a Paris is more like “everyday in Paris” because I listen to a bit of the book every day! Over and over again. I used the book to prepare for my trip to Paris, then spoke French every day of my time there, then continue studying now that I’m home. I just love this approach to the language. I’m sure that I still butcher the plus perfect, but oh well. While in France, I was able to communicate almost anything I wanted and that was absolutely the best part of my travels… Even above the fabulous sites! The BEST on-line French lessons, hands-down! The only site I’ve found that concentrates on how French is ACTUALLY spoken by natives! Really helpful! What I love about Camille’s audio books is that you can listen to them over and over again, especially if you have put them on your iPod or other portable device. Just this morning I took a long walk around the neighborhood and listened to a couple of chapters on my iPod. No matter how well your comprehension develops, you ALWAYS hear phrases and expressions that make you say, “Well, of course! I have to remember that one!” The process to download the content is flawless (unless you are a complete luddite!). I just never tire of listening to the books because the content is so practical and I love the sound of her voice. Hers is an accent and register of speech that one would be wise to imitate. So far. It’s great. I didn’t give it 5 stars yet as I have not had the chance to use it fully as yet. I would like an audio dictionary. It would be very helpful to hear the correct pronunciation of a French word. I got the French Confidence Builder – Bundle in April which contained of “Une Semaine à Paris”, “Mastering French Adjectives” and “Secrets of French Conversation”. I was delighted to find out how interesting and entertaining the audiobooks are and how much of the every day used vocabulary is there. Everything is explained in such a simple and fun way. I find myself knowing words and expressions that I didn’t suspect I had remembered from listening. The audiobooks are very convenient for listening any time anywhere. Camille has a really nice voice and I should say she is very articulate. I really like how she slows down on long and/or more complicated words, so I can hear exactly how to pronounce it. Thank you, Camille, I am very happy with your work and I will definitely continue with your audiobooks. The Une Semaine à Paris is a great way for the French learner to start to move towards the intermediate level. The audiobook is very well produced in very clearly spoken French, and the accompanying materials are very helpful. Not only is one able to learn to speak and understand French, but also learns quite a bit about that fabulous city, Paris. From comparison between the French text and the English translation, I have been able to considerably enhance my translation skills, steadily moving towards a more easily flowing style, using French that is much more authentic. A great product. This series has a great balance of established vocabulary and grammar with new vocabulary and grammar which is revalent to life style situations and has given me confidence that my understanding is better than I thought. The work book is great because it gives me phrases that I can actually learn and therefore use with confidence. I must also thank you for your article about different methods of learning french. I have tried a number of online courses but I’m actually going to a language school in St. Raphael in June so I now know what to look out for. I loved this audio book because it is exactly as advertised “A travel guide with a novel twist” It uses simple everyday language which is useful even if you are not lucky enough to be planning a trip to Paris yourself. For anyone learning French and planning a visit to Paris – this is a great way to prepare. 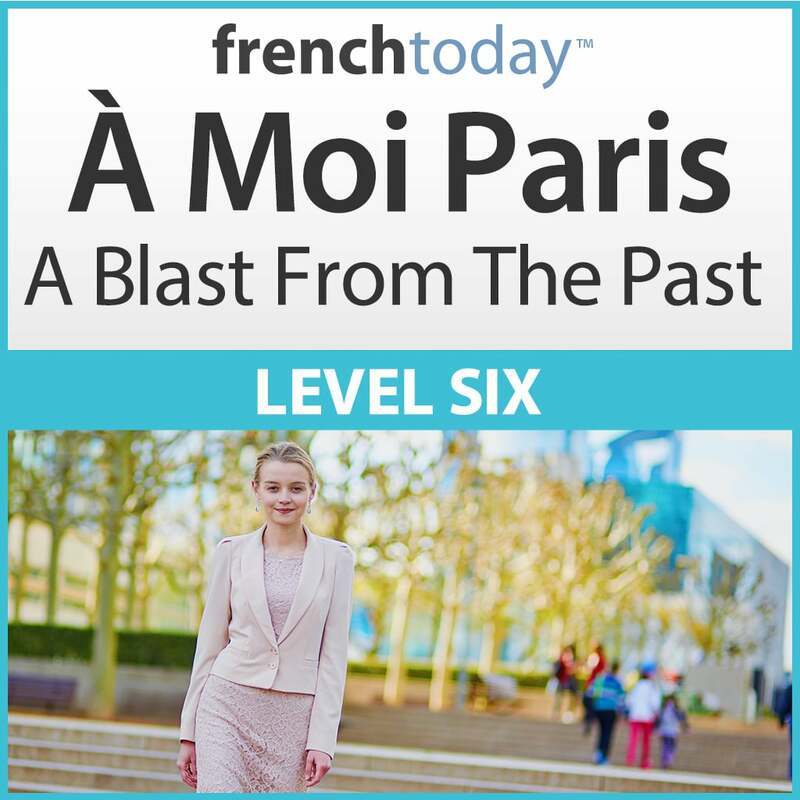 With simpler sentences than A Moi Paris, it is also useful to ensure you have the confidence to get the basics in conversation right. Of all the different teaching methods and books I have had on learning french Camille’s has definitely been the best for me. I have 5 of her books ,audio and lessons, and take French lessons on Skype with her. “Une Semaine a Paris” (novel and workbook) has been one the most useful French books I have ever used that has helped improve my pronunciation, listening skills, grammar and vocabulary. I also use her Audio French Lessons along with this book to improve the above. And, I really enjoy learning French with her and using her books! I thoroughly enjoyed using “Une Semaine a Paris” as a tool for improving my French. The vocabulary is very practical and will definitely be used when planning your first, or next, trip to Paris! I use the audio books to improve my French comprehension. They are useful but progress is still very very slow. This question book really completes the brilliant tool that is “Une Semaine à Paris”. Together, they form a great teaching method which could be used by teachers as well as people who study French on their own. Camille’s voice and rely on her materials above all others. I have also purchased À Moi Paris and À Moi Paris/2. When she says “repetition is the key” please believe it. It works! 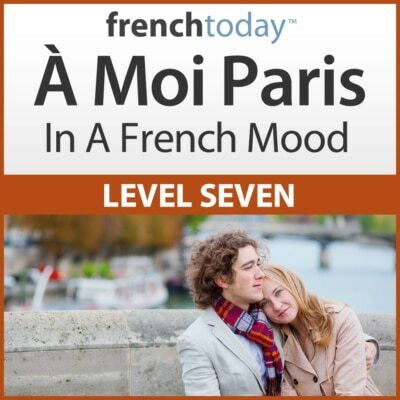 “Une Semaine à Paris” has been a wonderful tool for improving my French. It was worth every penny. For me it has been effective to start with the text in English, translate it into French, compare my translation against the French text, and understand the differences. After six months of study, my French is far better than it ever was in the past, I speak French with my wife every chance I get, and I’m very much looking forward to speaking French à Paris. I have been writing, editing and publishing learning materials for the corporate market for 25 years and I find Camille’s, Une Semaine à Paris to be one of the most effective learning packages that I’ve seen on any subject for the adult learner. I can warmly recommend “Une Semaine à Paris” to students and teachers alike. The novel was fun to listen to, I really liked the characters, the daily situations, and I learned a lot about Paris. The question/answer booklet was great to memorize the vocabulary. The recordings were slow enough that I could repeat the questions and answers out loud. It was great practice.